Are these the most popular wedding shoes on Instagram? Wedding shoes, in 2016, are about so much more than a white satin pump. 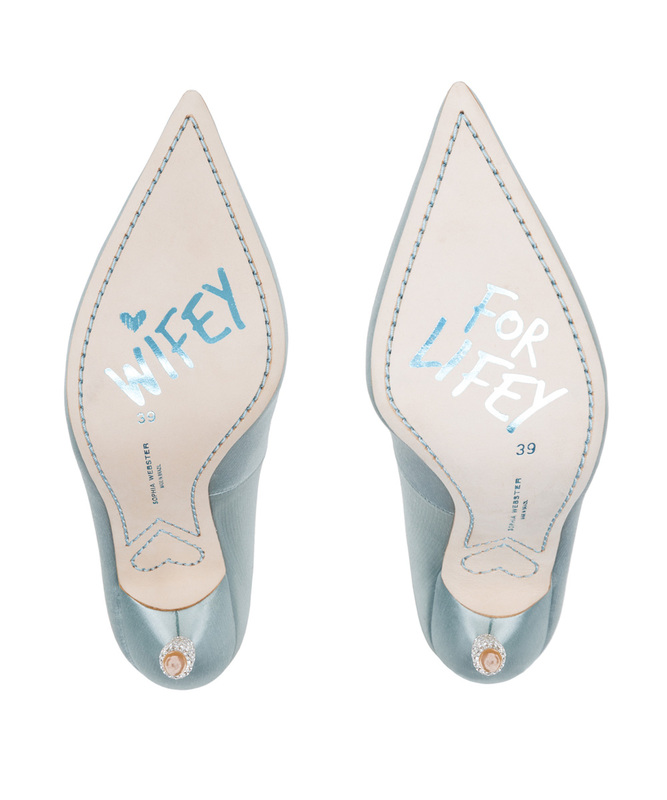 They didn’t used to get that much attention, buried underneath all those tulle layers, but then Carrie Bradshaw wore those popping blue Manolos, people started taking trophy shoe photos as a standard in every wedding album…Oh, and Sophia Webster made us realise how fun they could be. Explaining the success she’s experienced with her bridal shoe collection, which launched in March last year, Sophia says that her genius ‘Wifey For Lifey’ slogans always sell out because they provide cool brides with a punchy fashion talking point and, perhaps more importantly, the ultimate money shot for Instagram. Specifically, her Coco Crystal courts, below, which boast a crystal encrusted heel and that slogan stitching on the sole, are a best seller. ‘The ice blue pumps sell out every single time,’ she told the paper. And how many other designers can boast that kind of repeat success? ‘When I first decided to do bridal shoes I was not yet married so thinking about what I would wear for my wedding was a great starting point,’ Sophia told us last year when she first dipped her toes into the world of bridal shoe design. A year later, all of those initial designs are still holding their own. And the best news for brides-to-be? Sophia’s got plans to expand the range with new styles coming for the next round of production.